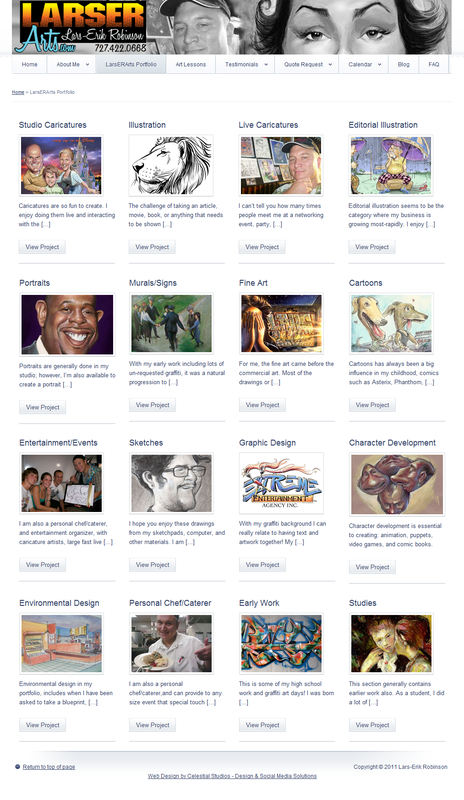 Examples of branding, marketing, and function in an artist's website. The website is his portfolio, blog, biography - and has functionality including: live calendar and list of events; forms for testimonials, quote requests, and contact; embedded YouTube videos of his art lessons, and much more. The prior website had since become outdated in terms of technology - method of update, and in the portfolio of work that Lars was presenting publicly. My re-design had several goals: 1) Produce a professional website, up to the standards of such a fine artist and person, 2) Combine the functions of the necessary site components into one package, 3) Develop the site completely in a self-hosted WordPress system, so that in the future - Lars or anyone with minor training could continue to manage or develop this site. All goals were achieved, and the Lars and his fans are very pleased. I continue to advise Lars on WordPress and the function of his website, but he is maintaining his calendar, pages, blog, and portfolio images. 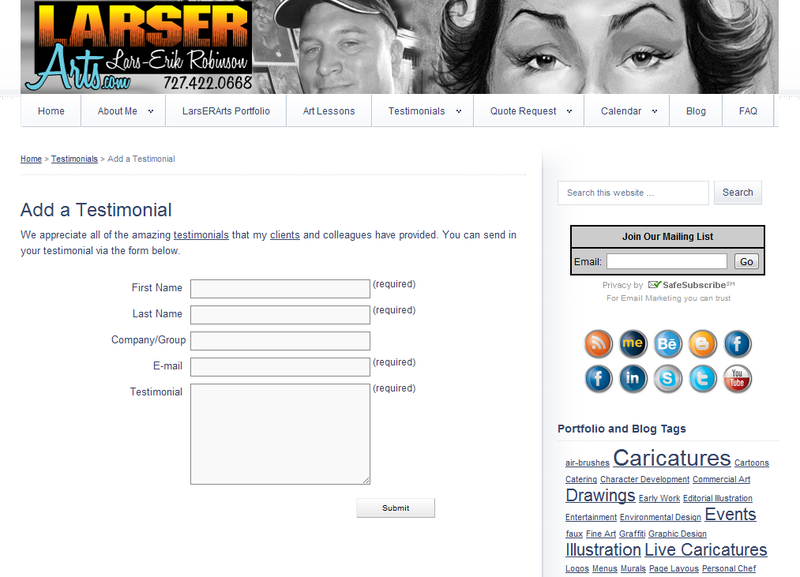 The LarsERArts Logo is a collaboration between Lars and Jason in terms of goal, color, and design. We make a great team. I made sure that it has a graphic almost comic book pop, with additional text in the signature, phone number and Arts.com that look hand drawn. Having the phone number as a part of the logo is helpful to his marketing campaign. The website uses a purchased WordPress template, and lots of plug-ins for look and function. I created the header using Lars' drawing and photo, and made most of the social media icons. The project was mostly about including all of the elements that Lars needed in a website, and in working with him on portfolio categories, copy, and in the addition of images that he felt represented his past work and current talents. 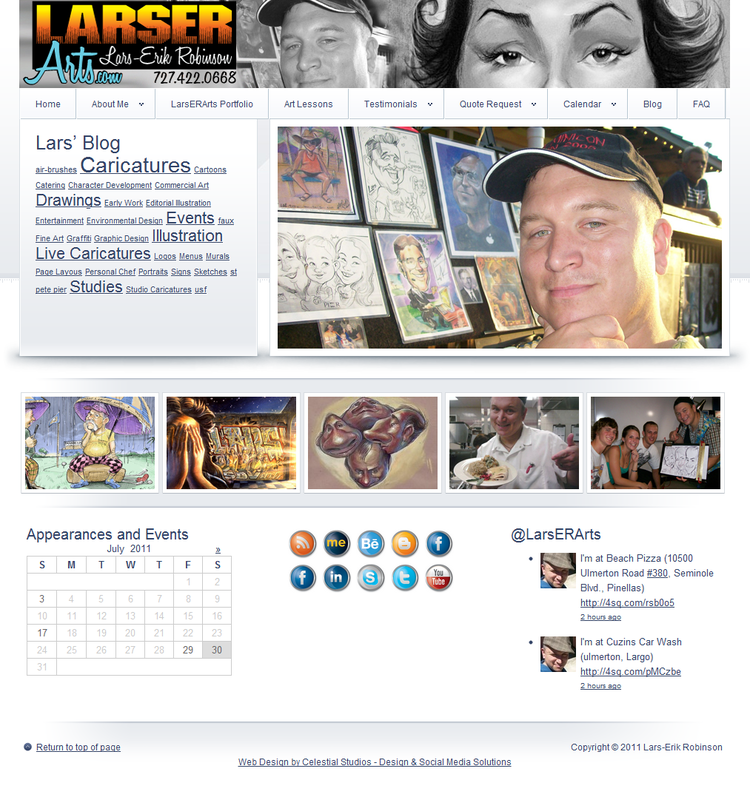 The main page on Lars' website includes a live tag cloud with links to his portfolio and blogs, a rotating series of images to the right of that, five random featured images from his sixteen category portfolio, a live Google Calendar of his appearances, links to all of his social media, and a live Twitter feed with the two latest posts from @LarsERArts. 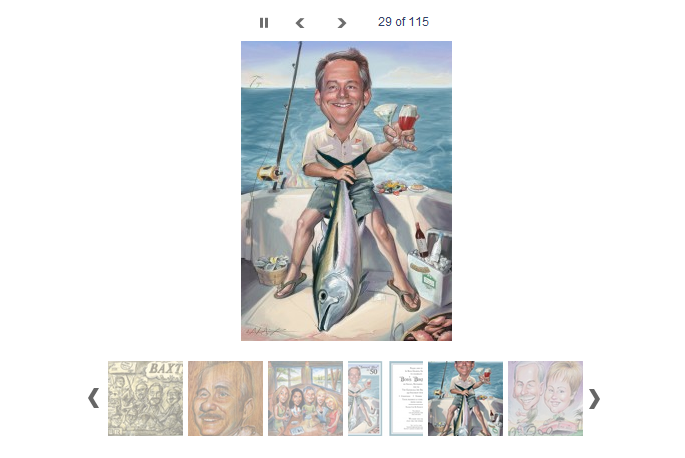 Lars' portfolio is the centerpiece and showpiece of this entire website. His talents and range also span twenty+ years and two continents. It is always a pleasure to work on a website where content is king. The portfolio pages are basically blogs, categorized as "Portfolio" and displayed on this page dynamically and in a specified order. A click of each image or "View Project" takes the viewer to a page about that category with text slideshow and thumbnail images. This is a page detail from Lars' Studio Portraits page. At the time of this screenshot, there were 115 images in this slideshow. The slideshow advances automatically, but can be controlled by a mouse click on one of three sets of arrows or on the thumbnails themselves. An image click pops up a full size image as a part of a full-size slideshow. Lars' artistic talents were the best asset in making this an amazing website. Forms were created for contacting Lars, requesting a quote, and submitting a testimonial. Here's an example of the styling. The results are automatically stored in a database, and e-mailed to the Lars.